I am a Starbucks Iced-Lemon-Pound-Cake addict. I just can’t seem to get enough of that delectably moist, lemony tangy, sweetly delicious pound cake. I’ve tried to replicate it once before…you can read about it here…but it wasn’t quite the same as the one I crave from Starbucks. Second attempt: Ina Garten’s Lemon Cake Recipe. Oh…..this is good. REALLY, really good. It is lemon heaven throughout. There is 1/3 cup lemon zest in the batter, a lemon syrup (very easy to make!) 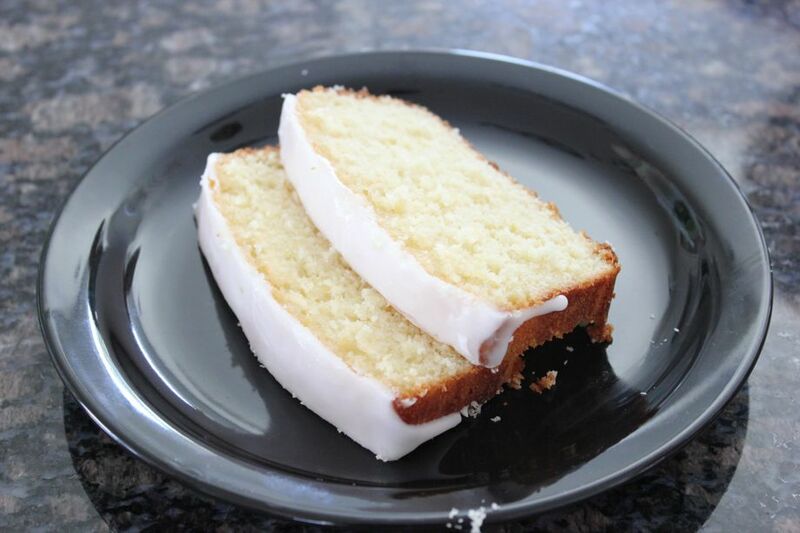 poured over the semi-cooled cake, and a glaze that is made with freshly squeezed lemon juice and confectioner’s sugar. If you’re a lemon-lover like me, this is YOUR kind of cake. So, now, the million dollar question. Does it taste like Starbucks? It is truly as lemony-delicious as the coffee shop’s version, but the crumb here is lighter and softer…not quite as dense. Will it satisfy your Iced-Lemon-Pound-Cake craving? NO doubt about it. This recipe is a keeper and, as an added bonus, it makes not one, but TWO loaves! Thanks!! Everyone who ate it LOVED it…definitely worth a go. Just forced myself to click the cover of the cake tin (does anyone call it a cake tin anymore?) after trying 2 slices because I wasn’t quite sure how good it was after the first piece. I made it take to a BBQ on Sunday. Hope it lasts that long. Almost 2 full loaves made it to the BBQ and were enjoyed by all…except me. The cake seemed a little dense by Sunday. I’m thinking maybe I’ll skip the glaze next time. And there will definitely be a next time. The syrup glaze…not the icing (right?) I thought it was perfect, as is, but I’d love to hear how it tastes without the glaze. I’ll be making it again soon!